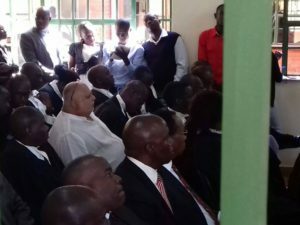 Businessman Sudhir Ruparelia (2nd row, in white shirt) appears in court this morning. Photo by Raymond Mayanja. KAMPALA–Commercial court Judge David Kutosi Wangutusi has urged Bank of Uganda and businessman Sudhir Ruparelia to carry out mediation. He appointed a lawyer Harriet Magala from Kituuma-Magala and Company Advocates to act as an arbitrator in the matter and gave them 60 days within which to amicably settle their differences and to report back to his chambers. The ruling followed an application in which businessman requested Court to strike off Bank of Uganda lawyers from the case against him. Through his lawyers Kabatsi and Bruce Musinguzi, Sudhir argued that the two law firms are heavily conflicted in the case brought against him by BOU and thus should be struck off from the case. Lawyers argue that it is prejudicial to Sudhir if Masembe appears at the bar and accuse him of fraud yet he has been his personal advocate for 12 years. He further argued that Sudhir will not get a fair trial or substantive justice since MMAKS and AF Mpanga advocates have been his long time lawyers and have become aware of facts which will prejudice his defence before court. They added that regulation 7 of the Advocates act prohibits lawyers from disclosing their client’s legal information at a lawyer’s benefit. According to regulation 9 of the Advocates and professional code of conduct regulations, any lawyer who has reason to believe that he might be required to appear as a witness in a matter before court is barred from appearing in the same case as an advocate. Sudhir’s lawyer’s say they have already fulfilled the requirements and have listed both Masembe and Mpanga as their would be witnesses and hence must excuse themselves in the case. Among the pieces of evidence that Sudhir says Mpanga and Masembe will be required as witness in court is where they are privy to information regarding a $9.2 million alleged extraction from Terminal Technology and another fraudulent transaction of $5.9million with Technology associates in Dubai. Another piece of evidence is an implementation agreement signed between David Mpanga and Sudhir on April 4, 2017 which is also at the centre of Sudhir’s counter claim against Bank of Uganda. Responding to the arguments, Bank of Uganda lawyers, Timothy Masembe and David Mpanga asked court to ignore the requests. In his submissions before Court, Mpanga said there is no reason for him to pull out of the case since all his services to Sudhir are protected by law and are not part of material needed in court. His colleague Masembe also reiterated the same, saying that whatever he did for Sudhir was in his line of duty as his lawyer.